Learning Center will provide new opportunities for students, meeting space for up to 400. Expansion of the Darr Agricultural Center will provide Missouri State University students with state-of-the-art classroom and lab facilities and Springfield and the surrounding community with much-needed event and banquet space. Expansion of the Darr Agricultural Center will provide Missouri State University students with state-of-the-art classroom and lab facilities and Springfield and the surrounding community with much-needed event and banquet space. The phase III expansion of the Darr Agricultural Center is part of Our Promise: The Campaign for Missouri State, which will generate $125 million in new, private investment for the university. The expansion will cost approximately $5.5 million to bring to fruition. It is led by a significant private gift from the Darr Family Foundation. “We are grateful to Bill and Virginia Darr, the Darr family and the Darr Family Foundation for their ongoing and generous support of the School of Agriculture and the Darr Agricultural Center,” said Dr. Anson Elliott, department head of the William H. Darr School of Agriculture. Conference space and a banquet hall accommodating up to 400 available for public and private events as well as large scale educational opportunities. “The center will also serve a need within the agricultural community and the community at large for specialized event space,” said Elliott. “Cattle shows and auctions, equine workshops and therapy programs, animal-judging contests, horticultural tours and other events are already regularly held there. Requests for usage of the facilities continue to outpace availability. 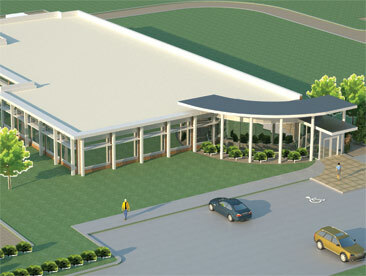 Senator Kit Bond, a member of the Senate Appropriations Committee, secured nearly $2 million for the expansion. The new facility is seeking LEED silver certification. University Architect Doug Sampson said students are helping shape the project. Several measures being incorporated in design plans include features to filter storm water runoff before it reaches the area streams, occupancy sensors that will shut down lighting and control temperatures when no one is in the room or area, the use of natural light where possible, and a special ground source heat-pump mechanical system to take advantage of the earth’s constant temperature 200 feet below the surface. A light colored roof will be installed in order to minimize the solar heat gain through the roof. The Darr Agricultural Center, located on 90-acres near the intersection of Kansas Expressway and Sunshine Street in southwest Springfield, serves as a laboratory and field experience classroom for the study of livestock management, equine studies, horticulture, agronomy, animal science, and wildlife conservation and management.